Per TSN’s Darren Dreger via Twitter, the Red Wings have traded defenseman Nick Jensen to the Washington Capitals along with a fifth-round pick for defenseman Madison Bowey and a second-round pick. I admit that I don’t know much about Bowey, aside from him being a 23-year-old defenseman. His million-dollar salary cap hit comes in higher than Jensen’s but the Wings have the room to make that work. I like that Ken Holland was able to get a player who has some NHL experience but it still younger and might have some upside. That said, another defenseman coming back the other way for Jensen doesn’t help the blueline logjam in Detroit. It’s possible that Bowey is just a body coming back to clear a roster spot for Washington. His salary can almost be buried in Grand Rapids. That, to me, is less than ideal as the organizational logjam already extends to the Griffins. His deal is a one-way deal, though, so that doesn’t seem likely. That said, the second-round pick in 2020 is worth it, to me. I like that Holland got the second rounder and I like that he pushed it out to 2020. Already having ten picks in 2019 (though one of their three fifth rounders heads to Washington in this deal), I’d rather see the Wings stock up for the next draft out. Especially if it was the choice between a higher pick in 2020 than in 2019 (which I have no evidence of it being, it’s just been suggested in the past.). However Bowey plays out, I like the deal. The Wings get younger and get a decent pick. The Detroit Red Wings announced on Tuesday that they will honor the life of Hall-of-Famer Gordie Howe by wearing a patch on the front of their jerseys for the 2016-17 season. 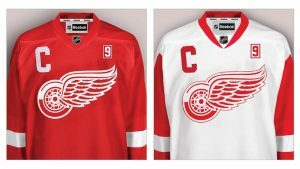 The patch – a simple rectangle containing Howe’s #9 – will appear on the left side of the chest, above the tip of the Winged Wheel logo and opposite the captain’s C and alternate captain’s A. On the red home jersey, the patch will be red with a white outline and a white number. On the white road jersey, the colors will be reversed. This patch is in addition to the “Farewell to the Joe” patch to be worn on the left shoulder this season. Howe’s #9 will also be painted on the ice behind each net. Team Sweden announced on Thursday that Detroit Red Wings captain Henrik Zetterberg will miss the upcoming World Cup of Hockey. Detroit general manager Ken Holland later clarified that Zetterberg suffered a knee injury while training. He has yet to have an MRI but the injury does not appear to be serious. Zetterberg, who was to serve as team captain for the tournament, is the second Swedish Red Wing to withdraw. Earlier this summer, Niklas Kronwall was replaced in the lineup by Anaheim’s Hampus Lindholm. Mikael Backlund of the Calgary Flames will take Zetterberg’s spot. It marks the second time that Zetterberg has been named Sweden’s captain only to not finish the tournament. At the 2014 Winter Olympics, Zetterberg played one game wearing the C before suffering a back injury. According to MLive’s Ansar Khan, who still has me blocked on Twitter, Red Wings’ forward Teemu Pulkkinen is out up to six months after having offseason shoulder surgery. #RedWings Teemu Pulkkinen had shoulder surgery in Finland in early June, expected recovery time 4-6 months. He is a restricted free agent. This would seemingly lower his value as a restricted free agent. Unfortunately, it also lowers his value as trade bait, if the Wings were trying to use him to acquire the much-needed defenseman. On the plus side, it opens up a roster spot on a logjammed forward corps, at least until his return. There is one small bit of good news. That salary can be buried in its entirety in the AHL should the Wings snap out of it and decide to punt this jackass down to the Griffins to hang out with Daniel Cleary. In something of a surprise move, the Red Wings added a second forward on Friday, signing Thomas Vanek to a one-year deal. Vanek agrees to 1 year deal with Detroit. Per Gord Miller of TSN, Vanek is set to make $2.6 million for the season. I half-like the move. The cap hit is friendly. The term is perfect. It’s a lot like the Brad Richards deal last year. The problem is the roster crunch at forward, but clearly the Wings are trying to swing a trade to fix their blueline so who knows what forward(s) they’ll have to give up. Vanek spent the last two seasons with the Minnesota Wild and was bought out this week. In 817 career NHL games with Buffalo, the New York Islanders, Montreal, and Minnesota, Vanek has 316 goals and 333 assists. According to his agent, Vanek expects to see time on the Red Wings’ power play.